I never used to consider myself a watch person, I always carry my phone on me and use it to check the time (more often than not by having to fumble around in my bag for ages just to find it!) but the more and more bright and bold watches that I keep seeing have quickly changed my mind! I NEED that pop of colour and am fast becoming obsessed with having some serious wrist candy! My only problem is i’ve found WAY too many that I love love love from The Watch Hut, so i’m sharing my top 10 with you here and would love to know which one is your favourite?! Needless to say, it’s my birthday soon….so…Mum, if you’re reading this…hint hint. 1: First up in the list is the one and only Kate Spade Metro Ladies Watch! You know how much I love pink. 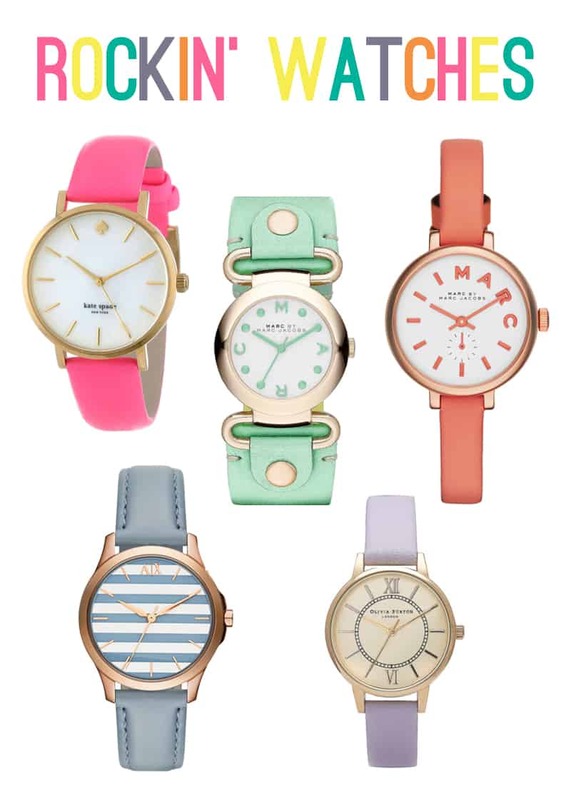 2: Another favourite colour of mine is mint green so the Marc Jacobs Mollie Watch has a special place in my heart! 3: How about a more elegant strap with the Marc Jacobs Sally Watch ? It’s so delicate and a whole lotta pretty! 4: I love the striped watch face on the Armani Exchange smart watch! It comes in a beautiful shade of green too! 5: Who could resist the lilac leather strap and the cream dial on this Olivia Burton Wonderland Watch?! 6: Next up is this modern and jazzy DKNY Watch, it’s so simple and stylish! 7: How cute is the bow on the face of this watch? It’s Kate Spade again of course! 8: Couldn’t resist one more Kate Spade watch could I?! This time, in all the colours of the rainbow with an awesome geometric design! 9: Sometimes I like to add pretty pastels to bright colourful outfits and this Anne Klein Watch is a gorgeous shade of pastel pink! 10: Last but certainly not least is the beautiful and oh so dainty Komono Moneypenny watch, I love how the hands match the strap!